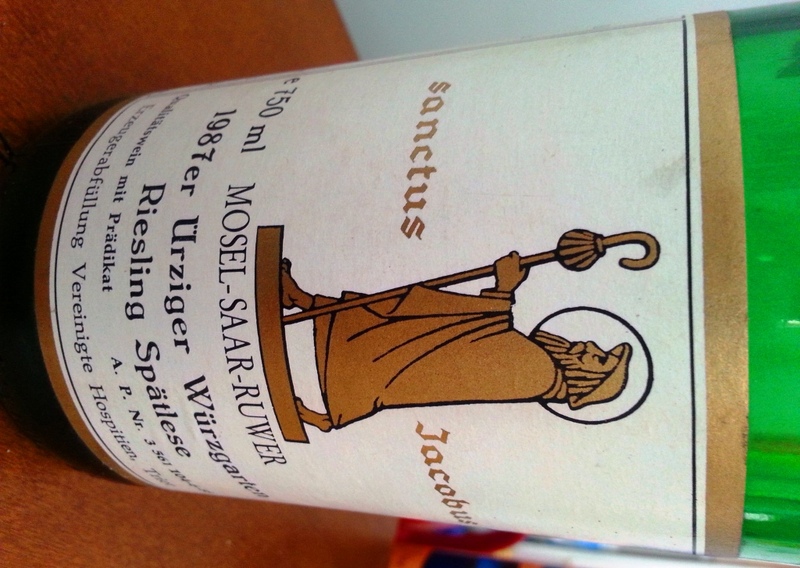 I mentioned this wine in an earlier post, when I was talking about how German rieslings can age. I think it is proper to describe the wine in full. 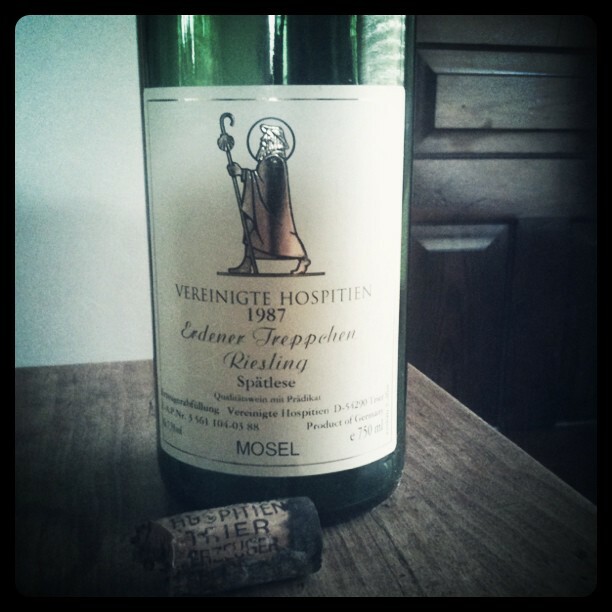 The Vereinigte Hospitien (“Unified Hospices”) winery in Trier has a loooooong history and tradition. Its name stems from the fact, that until German Mediatisation in the early 1800s, most hospitals were run by the Catholic church. The Trier hospitals, that were also called hospices at the time, were unified into one corporation under public law in 1804 by Napoleon. A lot of these hospitals financed themselves by owning vineyards and selling the wine (just like universities at the time). The Vereinigte Hospitien are still a corporation under public law, maintaining several hospitals and nursing homes, and are a big employer. But they also never gave up winemaking, though. Through the church possessions, they own property in some of the most prestigious hills along the Mosel and Saar rivers. 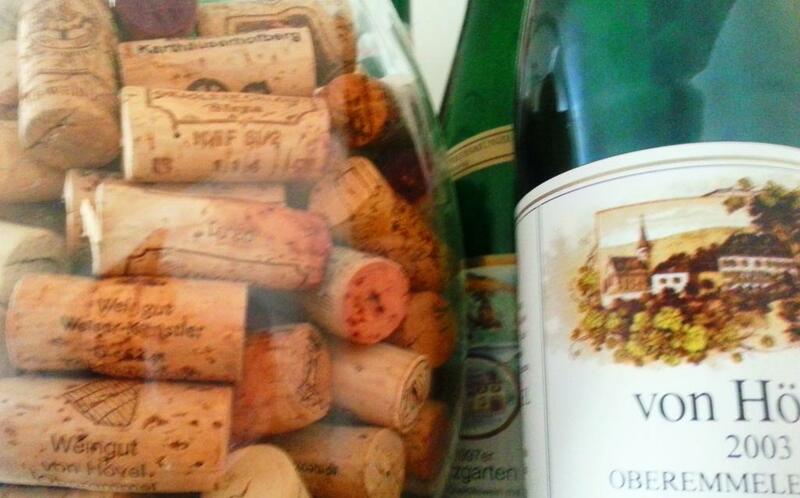 Most notable is the Scharzhofberg, one of the most famous German vineyards at the river Saar, but also Piesporter Goldtröpfchen, Wiltinger Kupp and others. The winery has a tasting room were you can try the wines for free. Even better, ask for a wine tasting with friends in their cellars, which are among the oldest in Germany…dating back to Roman walls of the fourth century AD. 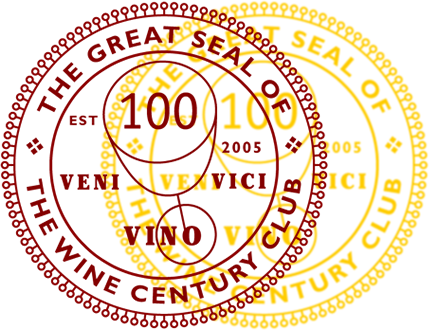 I have been quite fond of their good but affordable quality wines. If ever you get to Trier (be it for its Roman ruins, medieval history, or any other reason), I recommend you go and check out this winery. 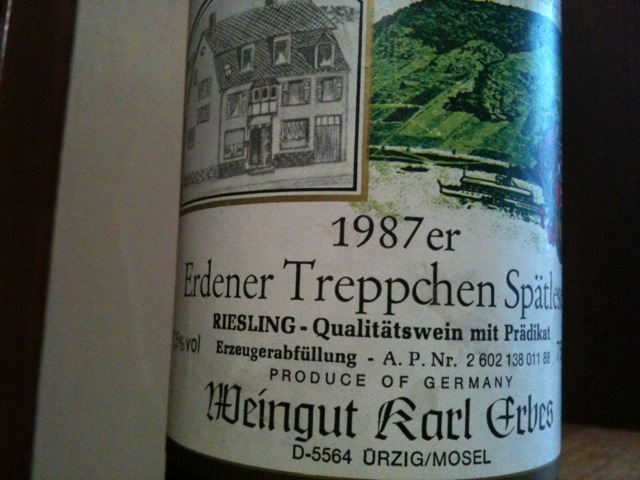 Now, this 1987 I got at the winery shortly before I left for Ann Arbor. It happens to be Nina’s birthyear (not a very good year for German wines), and Erdener Treppchen, a vineyard in the central Mosel valley, is one of my favorite. To me, there is something special about old wines. I immediately have to think about what happened in that year, and it feels like the wine gives me access to a time that is passed. 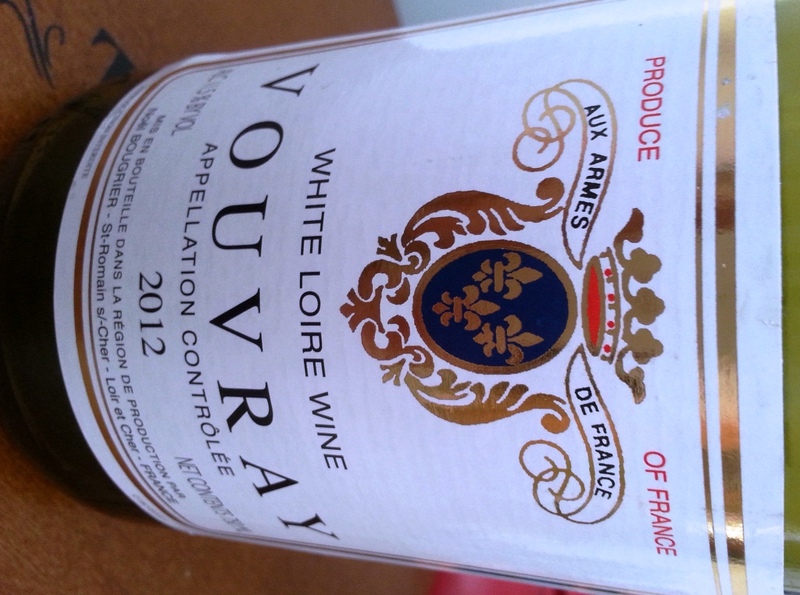 It is like a captured moment in time, that has aged as well, and will be gone when I finish (or pour out) the bottle. It is almost magical. We opened it for Nina’s birthday party. I decanted it for about half an hour. 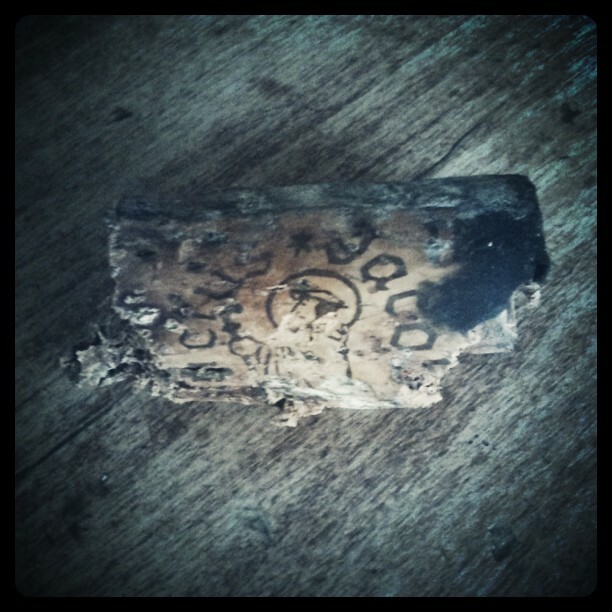 As you can see on the photo, the cork had deteriorated quite a bit, but when I pulled it, it was clear that it had not destroyed the wine. The color was a lighter rhine stone. The nose seemed quite complex, I smelled honey as the strongest. The taste was surprisingly fresh, with a well boiled down alcoholic tone. Unfortunately, and I guess this owes to the rather weak vintage in general, acidic notes were strong and dominated the palate to a degree that some found objectionable. I thought it was still an acceptable level…it was yummy! 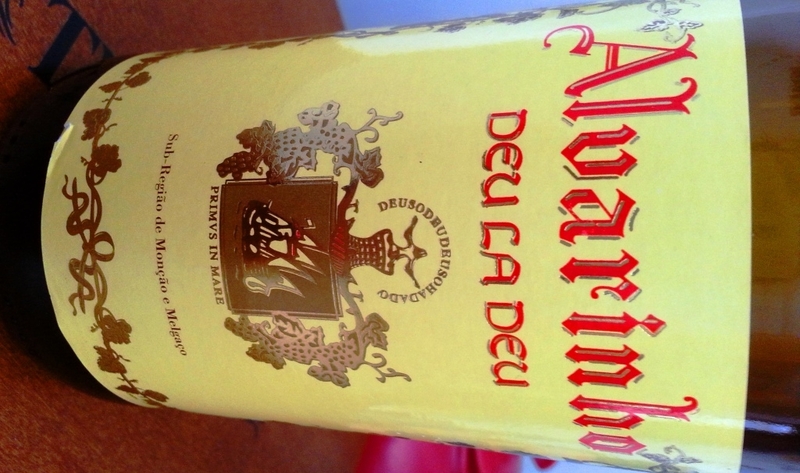 With older wines, it is interesting to see how they taste after they have been open for a while. So, we preserved some and after two days, tobacco and leather smells started dominating the nose, but with beautiful hints of strawberry. It just kept wowing me.